I'M YOUR VENUS: Zaky takes a “holistic” approach to loving herself. DESIGN STARS: It's a fashionable party of five on MC. After weeks of sweat-inducing challenges and nail-biting eliminations, five designers are left to duke it on Season Two of Mission Catwalk for an attractive array of prizes, including the chance to send a collection down the runway at the upcoming London Fashion Week, scholarships, as well as cash awards. In addition to longtime favourites Rebecca Stirm (Belize), Gregory Williams (Jamaica) and Crystal Powell (Jamaica), the lucky five includes Bajan hopeful Kerin Scott and Trinidad’s underdog Ryan Chan, who finally snagged a challenge win on Tuesday night when his teen prom-perfect creation scored highest among the judges. Meantime, this year’s top 3 finalists will have some of their finest pieces among the collections at Caribbean Fashion Week (CFW) for a veritable showcase showdown on June 8.
WHO NEEDS CHARISMA: Is Delano Seiveright the most hated man in Jamaica? REBEL SPIRIT: The polarizing G2K leader is on the move. To say the very least, over the course of his G2K sojourn, the 28-year-old Seiveright has ended up in quite a few bad books – among them his vicious critics. “Those people are usually comrades or hypocrites,” he concludes without missing a beat. 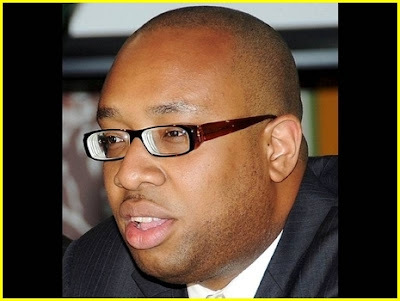 Regarding his tenure as leader of the JLP’s youth arm since 2009, Seiveright (whose resignation takes effect this Friday, June 1) makes it clear that the organization was constantly faced with tough choices. In the run-up to last December’s General Elections the G2K found hard-hitting tactics, including antagonizing the Portia Simpson-Miller-led People’s National Party with scathing TV and print ads. They played a dangerous game and their party lost – badly – in a landslide defeat at the polls. The blame for the JLP’s humiliating exit from power was largely dumped on the G2K. 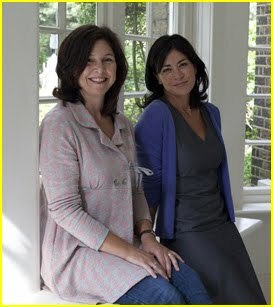 But mostly on Seiveright, who has been called everything in the book from arrogant to polarizing to overly zealous. Many felt he should have quit the presidency months ago. In spite of his perceived bad qualities, no one can deny that Seiveright possesses, in substantial measure, a fearlessness and decisiveness that often reliably indicate the ones destined for greatness. So what’s his next move? While it’s unclear what he’ll be doing post-June 1, it appears that the JLP’s enormous loss at the 2011 Elections will be part of the stigma by which Seivwright will be ultimately judged. 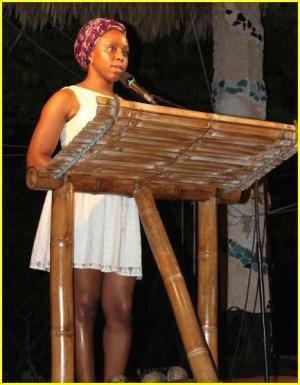 On Friday night, while sharing a passage from her sharply observed memoir, Chimamanda Adichie was swarmed by hungry mosquitoes mid-way through her presentation and had to be sprayed with repellant. The Nigerian-bred author (and past Orange Prize winner) managed to finish her stint like a trooper, but she was nowhere to be seen at the readings on Saturday. A chat with one of the festival’s organizers revealed that Adichie was holed up in her hotel room with the hubby. Totally understandable. Essential Adichie: Half of a Yellow Sun and That Thing Around Your Neck. A struggling off-Broadway actor (Richard Dreyfuss, excellent) moves in with a former dancer (Marsha Mason) and her precocious tween daughter (Quinn Cummings) in the wake of her married lover’s sudden departure. Written Neil Simon and deftly directed by Ross, it’s a highly enjoyable and sympathetic look at how friendship can bloom into romance under the strangest of circumstances. 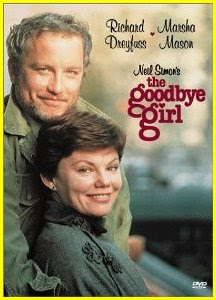 Well-acted (Dreyfuss nabbed an Oscar), frequently humorous and compassionate, The Goodbye Girl wins you over with it’s clear-eyed exploration of human relationships, loneliness, and the art of picking up the pieces. TV J has decided to inject their Friday night lineup with a fresh dose of home-bred humour, attractively packaged in the vessel of Cabbie Chronicles, a witty and hilarious animated series which follows a much put-upon cab driver and his batch of colourful customers (like the painfully funny Fluffy) as they traverse the hot city streets. 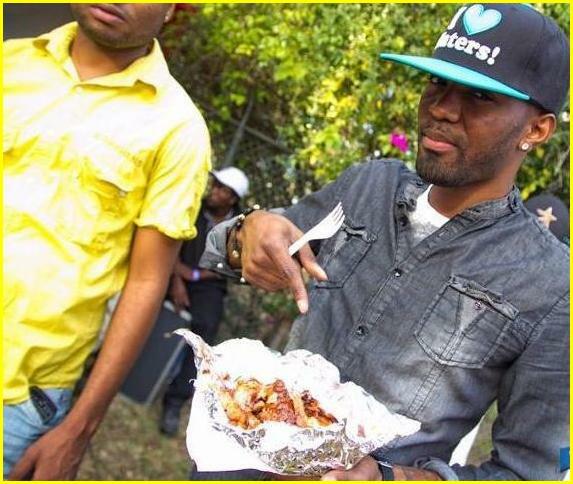 EATING OUT: May 27, Kingston. Konshens prepares to chow down on some freshly prepared jerked chicken following his performance at the CB Pan Chicken Championships, Eastern Eliminations, at the Ranny Williams Ent. Centre last Sunday. (Photo: STUSH). TWO'S COMPANY: May 27, Kingston. 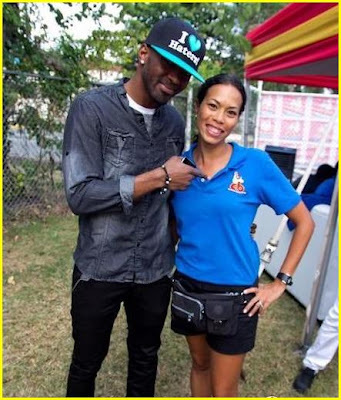 The ace entertainer, whose provocative new hit "Stop Sign" is currently riding the dancehall charts, was also seen enjoying the company of Kimmi Mullings of CB Chicken at the event on the grounds of the Ranny Williams Ent. Centre. Check out the cap! (Photo: STUSH). SIZE MATTERS: May 25, Kingston. Cozying up to a pretty young thing, supermodel and Pree Dis host Casmar James was spotted sporting a sleek new haircut (and a pack of XL rubbers) at last Friday's Rough Riders-sponsored Maydaze Krazy Dress Up in the city. (Photo: Skkan Media). FAST FRIENDS: May 26, St. Andrew. Yohan 'The Beast' Blake recently picked a winner (Khalil Munroe) for his inaugural Show Your Stripes competition, which comes with an attractive prize of an all-inclusive trip for two to New York to watch Blake blaze the track at the Adidas Grand Prix on Saturday, June 8. 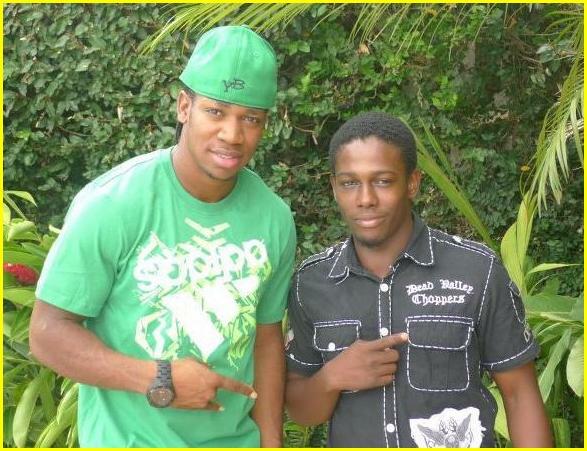 (Photo: Yohan Blake). FOUR PLAY: May 26, Kingston. 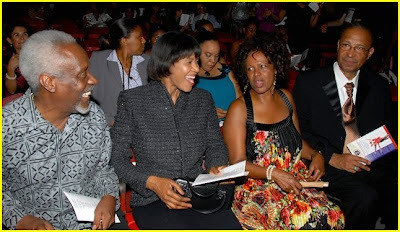 Last Saturday night, a gleeful PM Portia Simpson Miller was in the house for the special performance of the Dance Theatre of Harlem at the Little Theatre. The recital was organized by US Ambassador, Pamela Bridgewater, to commemorate the 50th anniversary of diplomatic relations between Jamaica and the United States. Sharing the photo-op: former PM P.J. 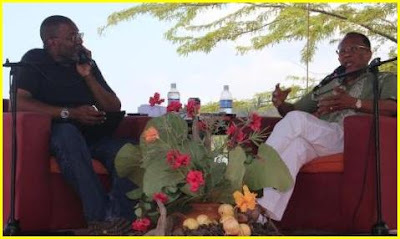 Patterson (left) and Bridgewater's hubby, Rev. Russell Awkward. (Photo: OPM). 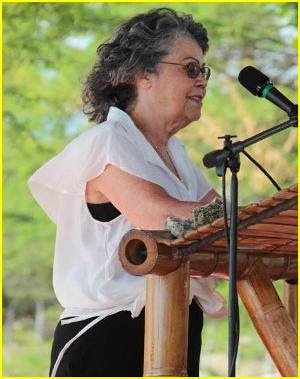 Olive Senior has planted herself in the shade of a gigantic deciduous tree, sitting right beneath its red-and-white sign marked Silence Zone. 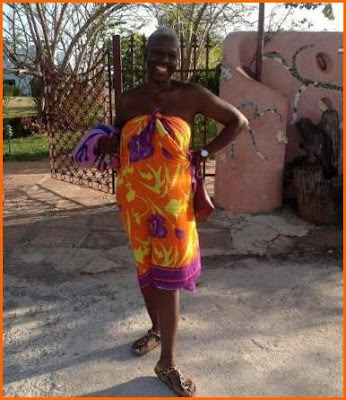 So on this warm Saturday afternoon in Treasure Beach it’s easy to locate her among the large Calabash crowd. 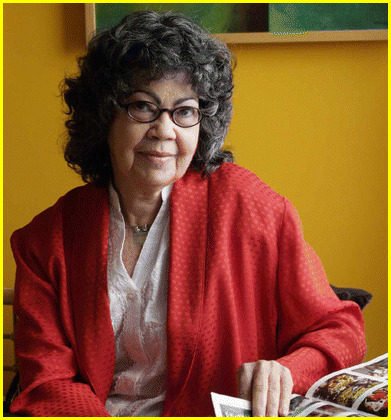 About an hour from now, the celebrated Jamaican writer will be reading passages from her delightful debut novel, Dancing Lessons, published earlier this year to immediate acclaim and a handful of award nominations, including the Amazon.ca First Novel Award and the Commonwealth Book Prize. SOLO STAR: "I hate monotony. I choose music based on lyrical content." The mission behind Freedom Fest: “It’s my charity. And the mission is triple R: Radikal reaching Radikal. I started out this thing years ago doing Recharge, but I wanted more than just a concert. So what I did three years ago was change the name to Freedom Fest. People are free to worship, free to enter and free to just have fun. It’s just as its name says. And we’ll have free health clinics all day. Last year we gave way about 300 reading glasses. This year we’re doing 400. This year the event is a three-in-one. We’re having the free health fair and fun day, we’re launching the new album, and it’s my birthday celebration as well. So we’ll be popping a little sup’m, sup’m. (Laughs). What’s on your music playlist? : Right now I’m listening to Dwayne Murphy, who is a bad, bad likkle artiste, and Sean Lypher. 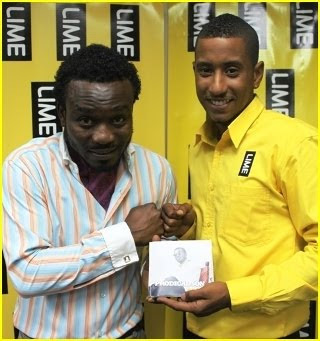 I like John Legend, Junior Gong, Konshens, and Sasco. Those are the ones I’m listening to right, right now. I hate monotony, so I choose music based on lyrical content. I really like how Junior Gong puts his stuff together. The guy just sees things differently. Outside of black and white, you have colours. And that’s what I like. Three things you can’t live without: My family, money, and God. Latest fashion splurge: A Carlton Brown suit. Travel essentials: Cologne, Bible, money and my cellphone. Made you cry: Losing my grandmother a while back. I lost my mommy last year, so Mother’s Day was a bittersweet moment for me. I cried for almost the whole day. Memorable concert attended: Beres Hammond’s “A Moment In Time,” the first one, at the National Arena. What do you consider your greatest achievement? : Being able to give back to society. What is your current state of mind? : I really want to achieve more so I can give more. I want to build a half-way house. Who are your heroes in real life? : My grandmother, even though she’s gone. I really admire Tyler Perry. And God, of course. If you could change one thing about yourself what would it be? 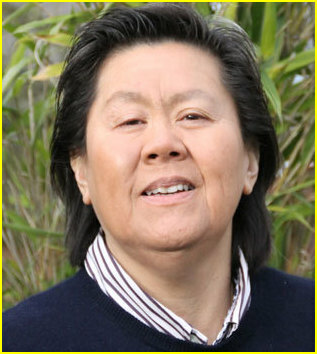 : I wish I could grow my hair longer. (Laughs). DREAM TEAM: Prodigal, with Stephen Miller of Freedom Fest sponsors LIME. >>PART I: Prodigal on his new album, fashion and fatherhood. 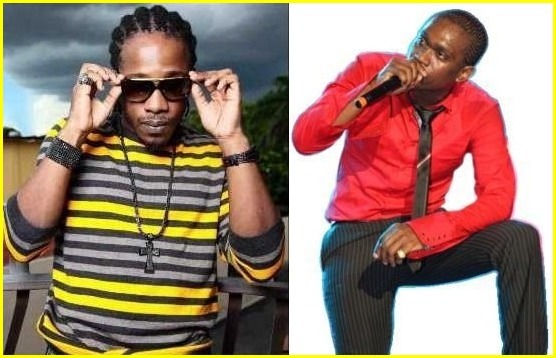 HEAVY HITTERS: Wayne Marshall (left) and Busy Signal. The legal woes that have befallen entertainer Glendale ‘Busy Signal’ Gordon within the past week have snagged headlines across the media landscape and drawn responses from industry insiders and colleagues in the music fraternity – but with very little detail about what actually led to the deejay’s troubles. 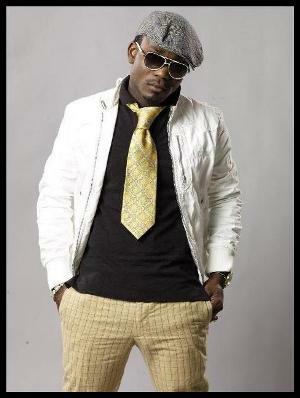 The dancehall star was arrested on a US extradition warrant last Monday after he was deported from England. According to The Sunday Gleaner, he is to appear in court in the US to answer a charge of failure to appear for a trial after a 2002 arrest on a cocaine charge. BRIGHT IDEA: Cooper at Jake's for Calabash 2012. A finger-lickin’ feast of the spoken word, a breathtaking seaside setting, glorious (if a tad overpriced) food, effortless clothes and a marvelous sense of fellowship. 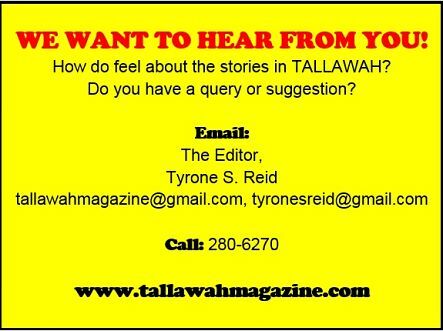 What’s not to love about the Calabash Literary Festival? Toss into the mix the all-embracing spirit of Jamaica 50, and you’ve got a bonafide recipe for a good ole time. By all appearances, all of society was represented in Treasure Beach on the weekend. Looking gorgeous in white, black shades and a neat little ponytail, culture minister Lisa Hanna put in two hours on Saturday before returning to her commitments back in the city. (Was that her young son sitting beside her?). National security minister Peter Bunting was also spotted, in shorts, tee-shirt and his signature shades. The likes of Calabash regulars Douglas Orane, Prof. Mervyn Morris, Marlon James, Linton Kwesi Johnson, Storm Saulter, Nile Saulter, Jay Will, Jean Small, Aston Cooke, Fabian Thomas, Brian Heap and Dr. Carolyn Cooper (who had her hands full signing people up and later hosting the Open Mic) mixed and mingled with the first-timers, local and foreign, making for a truly massive, diverse and interesting throng. To say the very least, Jake’s was transformed into a sea of vivid and vibrant colour over the weekend. But, not surprisingly, white was a popular hue of choice: lots of breezy cotton tops (like Lisa Hanna’s) and easy, strapless and spaghetti-strapped dresses. But overall it was a colourful mix. While the men kept it basic for the most part, the stylish women were the weekend’s scene-stealers, turning heads in ankle-grazing maxi dresses, bold prints (floral, spring-ready) – some of the best looks completed with a big floppy straw hat. Call it island-vacation chic. THE BRIGHT SIDE: May 26, St. Andrew. 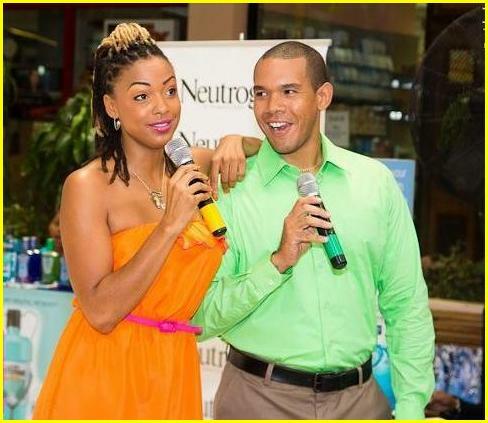 Hosting the proceedings at the Miss Jamaica World sashing of the 2012 finalists at Sovereign Centre on the weekend, FAME FM buddies Regina Beavers and Michael Cuffe look like fresh tropical produce ready to be devoured. Yum. (Photo: STUSH). WIPE ME DOWN: May 23, Kingston. 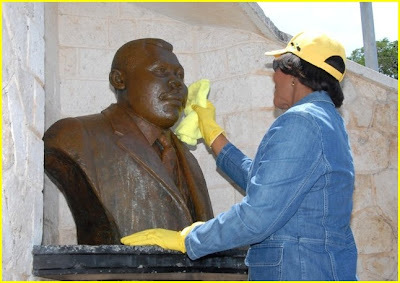 With her sharp eye for detail, PM Portia Simpson-Miller gives the bust of National Hero Marcus M. Garvey a royal cleaning as part of her Labour Day duties at the National Heroes Park on Wednesday. (Photo: OPM). THE SON ALSO RISES: May 16, The Netherlands. At a recent sold-out concert in Rotterdam, Grammy winner Stephen Marley invited rising reggae star Joe Mercer, to join him on stage for a brief father-son moment. The resemblance is uncanny! 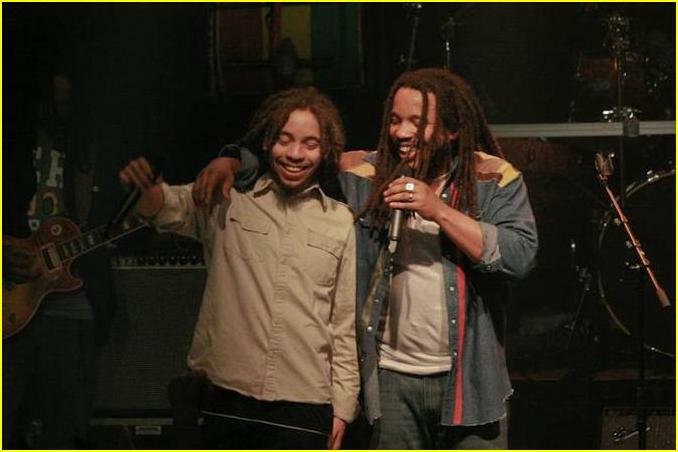 (Photo: Stephen Marley). 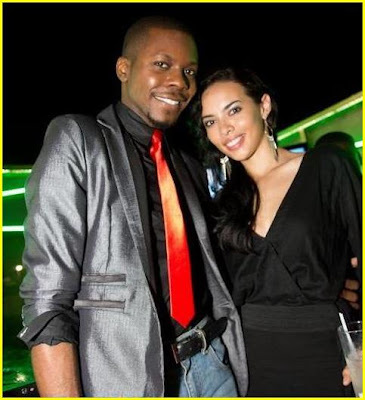 LEAN ON ME: May 26, Kingston: No doubt one of the best dressed 'pairs' of the night, Damian Shaw and Maya Wilkinson brought a classy touch of elegance to the Style Week after-party inside the Fiction nightclub on the weekend. (Photo: STUSH).